Too much coffee and tea can be a good thing. Let me explain. A few days ago, after visiting a client at White Plains Hospital Center, I stopped by their recently opened café for a cup of coffee and a freshly made gluten free blueberry tea cake. The hospital is known for its good care and the café is now following in that tradition, albeit gastronomically. As for the tea cake, it was delicious. I do not have food allergies, but a weakness for a good piece of plain cake. Twenty minutes later, I arrived in Harrison, New York at the home of a nearby client. The taste of the coffee was clinging to my palette and I secretly wished I had bought another of those sweet treats for later. Hearing the bell, Helena reluctantly opened the door, always suspicious of who is knocking (not a bad thing). Recognizing my name, she let me in. Sometimes I am sequestered in her foyer for the visit and other days I am escorted into the kitchen. Today was a kitchen day. We started our conversation and then, as it progressed, she asked if I wanted a cup of tea. Did I really want to forgo that lingering taste of coffee for tea? Truthfully, no, but I happily accepted. Why did I say, “Yes” when I could have just as well said “No?” It all has to do with purpose in one’s being. It’s a life quality that starts to wane as one gets older. You’re told to stop driving because you had a couple of fender benders. So now you can’t visit your home bound friend or be a volunteer driver for Meals on Wheels. And then the greatest upset of all, your spouse passes away. No one to cook that special dish which brought such accolades despite its simplicity. Such was the case with Helena. There was no longer anybody to make that cup of tea for, so how could I ever think of saying, “No.” I sat at the kitchen table and watched her take the crackled and stained mug out of the cabinet. Water boiled, she carefully handed me my tea, mystified as always, that I take it plain. 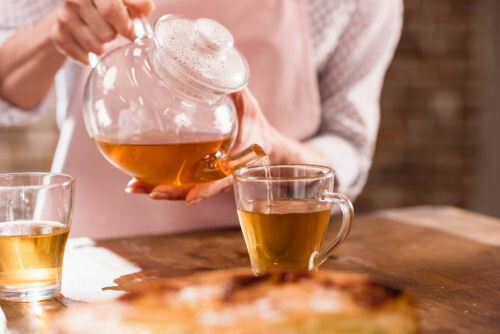 The act of making the cup of tea for this geriatric care manager, was both an act of kindness and the momentary gift of purpose. As for the taste of the coffee no longer lingering on my palette, it was surpassed by the opportunity to return to Helena a memory of time sweet, if not sweeter, than my blueberry teacake. It was a very good visit.